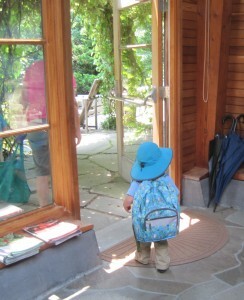 Kids in the Arboretum: The Best Day Ever! PHA Youth Education Programs are free to Vineyard elementary schools and closely adhere to MA Curriculum STEM Standards and Practices in Science. Each program combines an in-school lesson followed by a field trip to the Arboretum and is open to children of all learning abilities. The education program strongly believes that every student of MV is a scientist. The programs involve looking closely, asking questions, making collections, discussing, drawing and interpreting. The classroom visit gives every student hands-on time with plant materials, models, photos and uses appropriate scientific tools. The arboretum visit provides an outdoor laboratory of discovery. The field trip focuses on the classroom lesson and small groups experience the historic landscape, buildings, plants, animals, birds and insects, sounds and smells that create a special sense of place. Polly is no longer with us but she still provides inspiration by her great love of experimentation with plants and her ability to think outside the box. In her words ~ Educate yourself. Learn. The learning is the fun. Spring programs are offered mid-April through mid-June. Fall programs are offered mid- September through mid-November. Each program provides a one hour classroom pre-visit taught by our Youth Program Coordinator followed by a field trip to the Arboretum. During the arboretum visit for all programs, classes are divided into small groups. With volunteers and staff, students walk and inspect trees and plants with a focus of what was studied during the classroom visit. Students also observe the landscape, animals, birds and insects. At the end of the visit, students visit the FAR BARN and examine and discuss their collections and draw. All field study programs are free and are conducted in the fall and spring on weekdays from 8:30-12:30. Spring – Flowers Bloom: In the classroom, a brief discussion of what plants need to survive takes place, followed by students examining and comparing a wide variety of local flowers and their characteristics. Fall – Looking at Seeds: In the classroom the life cycle of plants is discussed with an emphasis on the production of seeds. Students are each given 10-15 different local seeds of trees and plants to examine and compare. These programs fulfill the MA Stem Standards in Life Science: K-LS1-1 Observe and communicate that animals (including humans) and plants need food, water, and air to survive…Plants make their own food and need light to live and grow. K-LS1-2 Recognize that all plants and animals have a life cycle: a. most plants begin as seeds, develop and grow, make more seeds, and die…. Spring – Plants with Flowers: In the classroom, there is a discussion of seasonal changes and those effects on plants. The emphasis of this lesson is the need for spring and summer weather for plant growth. Each student is given many different local flowering plants to closely examine. Plant structure is shown, seed production discussed and a game showing the parts of a plant/flower ends the session. Fall – Plants and Seasons Change: In the classroom there is a discussion of the life cycle of plants going into the fall season on MV. Students will examine a large collection of different plant leaves – both deciduous and evergreen. Students will be asked to notice similarities and differences in the leaves or needles of the same plants. These programs fulfill the MA Stem Standards in Earth and Space Science: 1- ESS1-2 Analyze provided data to identify relationships among seasonal patterns of change, including sunrise and sunset time changes, seasonal temperature and rainfall or snowfall patterns, and seasonal changes to the environment (foliage changes). Life Science:1-LS1-1 Use evidence to explain that: b. plants have roots, stems, leaves, flowers and fruits that are used to take in nutrients, water and air, produce food and make new plants. 1-LS3-1 Use information from observations to identify similarities and differences among individual plants or animals of the same kind. Spring – Introduction to Biomes and Ecosystems: In the classroom, students will look at photographs and simple information about 6 world biomes and ecosystems – Oceans, Grasslands, Deserts, Temperate/Deciduous Forests, the Tundra and Tropical Rainforests. Climate, rainfall, plants and animals in each biome will be shown. The Polly Hill fieldtrip will focus on the ecosystem of Martha’s Vineyard which is in the Deciduous Forest Biome, and its native plants and animals. Fall -Seeds Travel: In the classroom students will review the life cycle of plants and the conditions they need to survive and reproduce. They will examine many different types of local seeds and discuss why and how these seeds move to favorable locations to grow. The Polly Hill walk will show many kinds of seeds on trees and plants. A collection will be made for the students to examine, draw and describe at the end of the visit in the Far Barn. 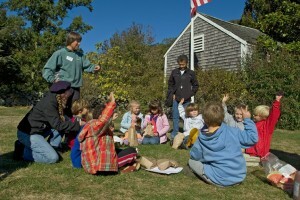 These programs fulfill the MA Stem Standards in: Life Science D – Biological Evolution: Unity and Diversity and B Ecosystems: Interactions, Energy, Dynamics 2-LS4-1 Use texts and media to compare: a. different kinds of living things in an area, and b. differences in the kinds of living things living in different types of areas. 2-LS2-3 Develop and use models to compare how plants and animals depend on their surroundings and other living things to meet their needs in the places they live. Example: Plants need light, water, minerals, favorable temps and animals or other mechanisms to disperse seeds. Spring – Biomes and Ecosystems: An in-depth study in the classroom of 7 major earth Biomes/Ecosystems and the plants and animals that live in each. Students will learn about the factors that influence the survival of a wide variety of plants and animals on our planet. Students will also be asked to consider how plants and animals adapt to each set of climate conditions. At the arboretum, students will look at plants in the Temperate or Deciduous Forest Biome and consider how they are influenced by inheritance or climate conditions and how various adaptations provide advantages for survival. Students will collect, discuss, examine and draw. Fall – Dinosaur Plants: In the classroom students will be introduced to the evolution of trees and plants on our planet during the three geologic periods of the dinosaurs. (Triassic, Jurassic, Cretaceous). They will examine plant material from the arboretum and photographs that show that many types of trees and plants from the time of dinosaurs also live today. At the arboretum students will visit the plants and trees studied in the classroom, review the dinosaurs of each geologic period and see real fossils of many. These programs fulfill the MA Stem Standards in Earth and Space Science: 3-ESS2-2 Obtain and summarize information about the climate of different regions of the world to illustrate that typical weather conditions in a year vary by region. Life Science: 3-LS3-2 Distinguish between inherited characteristics and those characteristics that result from a direct interaction with the environment… 3-LS-4 Biological Evolution: Unity and Diversity Both the Spring and Fall programs meet all 5 standards. Spring – Tree Detectives: This program consists of three visits both in class and at the Arboretum. Students study deciduous trees during 6-8 weeks from bud to full leaf growth. Tree structure and growth from sapling to maturity is analyzed. Trees are measured in a variety of ways and characteristics are compared. Students record, describe, draw, discuss and use a variety of tools and scientific methods. Fall – Plant Structures: In class, students will examine a large collection of deciduous and evergreen plants and their leaves/needles to observe differences and similarities. Students will discuss advantages of specific traits. During the arboretum visit students will view trees and plants and their various characteristics. They will collect specimens to describe and draw. These programs fulfill the MA Stem Standards in Life Science: 4-LS1-1. Construct an argument that animals and plants have internal and external structures that support their survival, growth, traits and reproduction. The Polly Hill Arboretum belongs to all of us who live on Martha’s Vineyard. Polly has left a wonderful treasure for us to enjoy. Student scientists of all ages are encouraged to visit the Arboretum with family and friends. The grounds are open to the public year-round from sunrise to sunset providing us with a wonderful outdoor classroom. Bring your journal, sketchpad, paints and camera and discover what this special place has to offer. Come often as each new season has different exciting things to see! VOLUNTEER AS A SCHOOL GUIDE. What a wonderful way to work with children, enjoy the Arboretum and meet new friends who enjoy the outdoors as much as you do. If you are interested in helping out please call us at 508-693-9426. The Arboretum is the perfect place for families to discover nature together, and our new Family Backpack Tour will help make this experience more fun and informative. These self-guided educational backpacks, available at the Visitor Center, contain a self-guided educational Arboretum map, field guides, magnifying glasses, sketch pads, and other materials to engage the entire family in nature studies during their visit.